Dubai has evolved from a small village to one of the most sought after holiday destinations across the globe. Tourists flock Dubai to experience the eclectic combination of exciting activities, fine dining and luxurious living. Dubai redefines the style statement with its luxurious skylines like Burj Khalifa and breath-taking tourist attractions like Al-jumeirah and Palms Jumeirah and top of the line accommodations. Check Dubai holiday packages for families and groups and get ready for a unique experience in one of the most popular and luxurious places in the United Arab Emirates. Dubai has strong summers with average temperature reaching 40 degree Celsius. Like all tropical desert belts, nights are relatively cooler and you can expect an average temperature to be 30 degree Celsius. Winter temperatures could range from 22 degree Celsius to 27 degree Celsius. Dubai offers diverse activities that can be taken up during your holidays. Here is a list of some exciting things that you can do while visiting Dubai. Experience the “Poseidon’s Revenge” at Aquaventure! You will be dumbstruck by the adrenaline pumping rides at this water park. You can experience beautiful aquatic life up close and take loads of pictures. Try out the thrilling rides at Wild Wadi Water Park which is situated in Burj Al Arab. 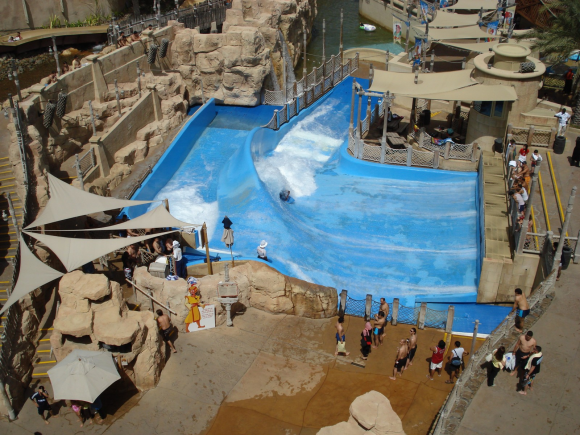 Wild Wadi boasts of one of the largest freefall waterfalls in the world. Equipped with 30+ rides, this water park will take you through probably the most adventurous trip ever. Also, don’t forget to visit Ice Land if you want to witness the largest collection of water slides in the World. You must take a desert safari when in Dubai, as it allows you to explore the dazzling sand dunes and exotic wildlife. You can enjoy Sisha and Bedouin coffee along with authentic barbecued dishes. Camel rides, sand boarding and belly dancing performances are some of the few high points of this entertaining safari. If you love speed, then a visit to Dubai Autodrome and Emirates Kartzone should be a must on your itinerary. Dubai Autodrome is one of the most sophisticated and elegant tracks in the world. You can experience three different levels of circuiting on this track. You can race around the circuit in a stylish Audi TT or a F1 style car. Dubai is the second best place to shop in the world. Duty free goods ensure that you save an amazing amount of money when you shop here. Some of the most popular shopping destinations in Dubai are Dubai Marina Mall, Dubai festival city, Gold Souk, Diera City Centre, Spice Souk and Dubai gold and diamond centre.